Temptress of Pleasure – or Mistress of Murder? 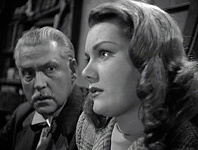 The Woman in Green is one of the series that's most regularly seen on television, probably because it's one of the films in the public domain. Inspector Gregson is in Lestrade's usual place and he needs the help of Sherlock Holmes in solving s series of grisly murders. It's another of Professor Moriarty schemes to enrich himself, this time he has the assistance of Lydia Marlowe with his villainous plan's hypnotism, murder, mutilation and blackmail. 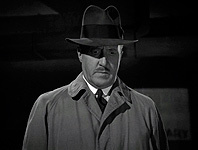 The film opens with Inspector Gregson's narration about a series of murders. At CID headquarters in London, the commissioner admonishes his staff over their failure to find the murderer of a series of young woman, who then mutilates the body by removing the right forefinger. 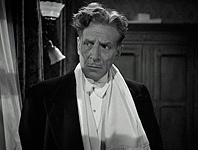 Inspector Gregson calls in Sherlock Holmes to help find the killer, so Holmes goes with the Inspector to view the body of the latest victim in the morgue. 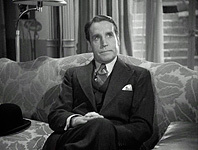 Afterwards, the two of them go for a drink, where Sir George Fenwick is also out, on a romantic night out with his girlfriend Lydia Marlowe, and after finishing dinner they go back to Lydia's flat. The next morning, Holmes and Watson are at the house of the latest victim looking for clues, when Inspector Gregson arrives and tells them of another murder in Edgware Road. George Fenwick wakes that morning, fully dressed, in a cheap boarding house in Edgware Road. In a befuddled state, he finds a severed finger in his pocket and becomes convinced that he is responsible for the murder of the young woman whose death is being announced by a nearby newspaper seller. 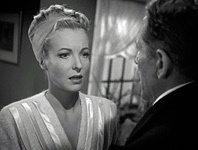 In a frantic state, Fenwick goes to see Lydia and explains his fear that he has committed a horrible murder. Whilst there, Professor Moriarty pays him a visit and he has Fenwick's cigarette case. Moriarty tells him that he has the case because it slipped out of Fenwick's pocket the previous evening when he was “bending over something, with a knife”. Sir George's daughter Maude Fenwick soon comes to see Holmes, she doesn't know that someone is following her but Holmes discovers this when he sees a taxi shadowing her, which parks outside an empty house opposite number 221b. 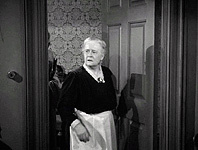 Maude tells Holmes that she saw her father burying something under a pile of soil in their front garden late at night. Holmes and Watson go to Sir George's house only to find him shot dead, clasping a match folder from the ?? Holmes now believes that Moriarty is responsible for the crimes. As Holmes and Watson are relaxing back in their Baker Street lodgings, Watson is called out on an emergency despite being retired. Minutes later, Moriarty calls on Holmes and explains that it was him called Watson so they could talk alone. Moriarty leans his chairs back and Holmes sees an open window in the empty house, directly opposite Moriarty's chair. Soon after the professor leaves, Watson arrives complaining about the hoax call before Holmes explains to him what Moriarty did. 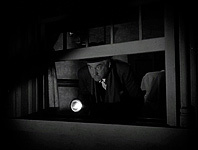 Holmes then asks Watson to go and investigate the house across the road. Inside the dark and empty house, Watson explores with a torch and in an upstairs room he sees a sniper shoot Holmes who is reclining in the chair in front of the window. However, Holmes soon appears and explains that he put a bust of Caesar in his place because he knew that as soon as he sat there, he'd be shot. 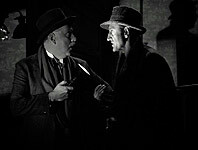 Lestrade arrests the sniper, an hypnotised ex-soldier, and takes him away to be questioned but the sniper is killed a little while later on Holmes' doorstep. Holmes now has a plan and contrives to meet Lydia at the Mesmer Club, where a sceptical Watson is the subject of a humiliating demonstration of hypnotism. Holmes does indeed bump into Ms Marlowe at the club, and as they are having a drink together later, he tells her he's losing sleep because he can not solve the murders. Lydia offers to help by way of hypnotising him and so she takes him to her flat, where she persuades him to imbibe some ‘cannabis japonica’ to help him succumb to her hypnotism. Once under hypnotism, Moriarty orders Holmes to write a suicide note before he leads him out onto the terrace. 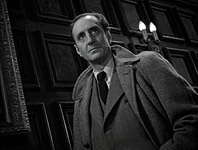 Moriarty talks Holmes into walking off the ledge but Watson and the police appear in the nick of time, and grab the criminals. Holmes reveals he wasn't really hypnotised before Moriarty escapes from the hold of a policeman and jumps from the terrace of Lydia's house to the building opposite. However, the drainpipe to which he clings comes loose from the building, causing Moriarty to fall – ostensibly to his death. 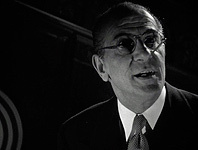 The film ends with Holmes talking with Watson of how the women of London can now go about in safety, and how privileged they both are to be able to watch over the city. Gregson: What's the lady look like? Holmes: Oh, about thirty, nice figure, blonde, lustrous eyes. Watson: Really? Got her 'phone number? Watson: You mean you're not hypnotised? Watson: Then what on earth are you doing, you idiot? Get down! Holmes: I smell the faint sweet odour of blackmail! Watson: What are you thinking of? Holmes: I'm thinking of all the women who can come and go in safety in the streets of London tonight. Stars keep watch in the heavens. And in our own little way, we too old friend, are privileged to watch over our city. The Breen Office ordered two cuts from the original script. First, the victims were supposed to be young girls not young women. And, in the Mesmer Club, Watson was supposed to take off his trousers, not just roll up the leg. 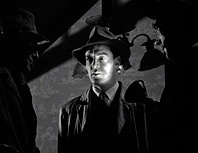 The sniper firing at Holmes' bust is taken from a story in the original canon, The Empty House. The only reference to Mycroft Holmes in the series is made in this film, but he doesn't appear on film. “Edgware Road” is misspelt “Edgeware Road”. When Moriarty and Lydia are arrested on the terrace, film crew can be seen in the background. The intro to the film, the only one to be narrated. Watson under the influence of hypnotism at the Mesmer Club.